A fellow author, Mary Fan, is great at conducting author interviews. She interviewed me recently and inspired me to do the same. 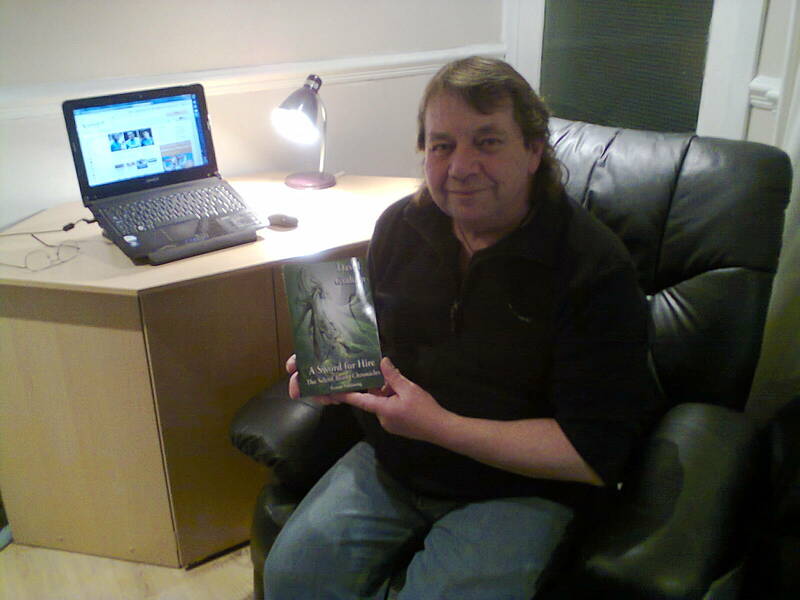 Today, I’m posting my first author interview in my ‘Meet the Author’ Series. QUESTION: I’d like to introduce you to David Graham. Hi, David! Welcome to Susan Finlay Writes blog site. Can you tell us a bit about your background as a writer? ANSWER: Hi Susan, and thank you for this interview. Being a huge fan of the fantasy genre most of my life it was inevitable that I would eventually begin work on my own novels. Having said that, I soon found out it was not as easy as it first seemed. There are so many fantasy authors out there and coming up with something unique rapidly became obvious. I began by creating basic characters, and these slowly evolved and grew till I was satisfied with them. Then I created a world for my charcters to live in and this, I found, was the easiest part of the whole thing. But what was I to do with this…? After many false starts it finally came to me. Many years before I began writing the Silent Blade Chronicles, I had writen a small poem, and it was this poem, titled “Nightwing”, that was to become the core element for the Chronicles. From there the story began to flow, and the result was book one “A Sword for Hire”, which was finally published on Amazon kindle on the 20th of December 2011. QUESTION: Ecanus Publishing has published two fantasy novels in your book series, The Silent Blade Chronicles. Can you tell us a bit about your books? What inspired you to write them? How many books do you have planned for the series? ANSWER: My inspiration comes mainly from such great writers as Tolkien, Sir Terry Pratchett, and Anne McCafrey. I have already mentioned “A Sword for hire”, the first book in the series. It is basically a vehicle to introduce the main characters, and explains how the Silent Blade came about. It deals with the fate of four very different and unique people, bringing them together to help save the world with their distinctive abilities. Unkown to them, and everyone else on the world of Endovaar, dreadfull events that happened eight hundred years previously, are about to come to the fore once again. And so, what seems like a fairly straight forward quest, rapidly ascalates into something truly terrible. The second book in the series is called “The Tomb of Sharakir”, and takes our heroes on yet another dangerous quest. But, they quickly discover that the evil they thought they had destroyed at the end of their first quest has come back to haunt them, and once again ancient legends and prophecies are coming to life. Initially I had three books planned for the series, making it a traditional trilogy. But while I was emailing my editor one evening he said something in one of his replies that got me thinking. It was then that I decided that the story should not simply end with a large battle, but should carry on into another two books, making five in total. This was actually easier to do than you might expect, as throughout the first three book there is one character who we never meet in person. In fact everyone thinks he died long ago. This character was responsible for many of the events that happened eight hundred years before in the story line… but what would happen if he suddenly appeared at the end of the third book? QUESTION: Where did you get your book covers? Did you Ecanus design them? Did you have any say in what they produced? ANSWER: Yes, Ecanus designed the covers, and I did have a lot of say in the final designs. When we were working on the cover for book one we tried several designs, all of which were really good in their own right. But as soon as I saw the green cover with the stylised dragon I knew that was the one. We then agreed that we should have a traffic light theme running through the first three covers, which is why “The Tomb of Sharakir” has an amber cover, and “Deathbane” will have a red one. The fourth and fifth books will likely have black and white covers. QUESTION: How does it feel to be a published author? How are you dealing with marketing and advertising? Have you done any public launch parties, book readings, or book signings? Have you met any fans in person? ANSWER: Being a published author is a fantastic feeling. I see my books as my children: having nurtured them through all the agonies of creation and growth, through to the publishing proccess, and finally watching them go out into the big world for the enjoyment of all. My editor deals with most of the marketing, and I do my bit through such platforms as Face Book, and my Silent Blade blog. So far I have not been given the chance to do any public launches or signings, but that will come through time. As for fans…? Yes, I have met several. The best example of this, and one that came as a total surprise, was when I was accosted by two elderly ladies one day while I was working at a large hotel. It turned out that these two lovely ladies were true fantasy buffs, and to my delight they had downloaded my first book, and loved it. They wanted to know if it was out in paperback, and luckily it had come out a week before. They were delighted, ( and I was rather dumbstruck ) and after giving them my autograph they drove off. But that was not the end of that episode. Two weeks later they caught hold of me again, both of them waving my book in the air and shouting “We got it, we got it !” This, of course, just proves that my books appeal to all ages. QUESTION: At some point or another, all writers come across the “rules” of contemporary writing: no adverbs, no dialogue tags, show don’t tell, etc. In your opinion, how important are they to writing? Are there any that you particularly adhere to? ANSWER: Hmm, this is a tricky one for me. Having no formal literary education I can only answer this question in one word “Freestyle”. This must mean that I am a literary anarchist, as I never adhere to any rules and simply let the words flow onto the page as they come to me. However, if I were to have one “rule” it will be that if it looks good and reads well, it must be okay. QUESTION: What is your favorite or least favorite part of writing? Do you have any writing routines—special places where you write, a particular time of time, music that you listen to while you write? ANSWER: Sometimes writing can be a real pain! Having written several thousand words in an evening I will then read it back and find I have to delete most of it and either start again, or even leave those parts out altogether. Then there are times when I will write a particular passage and be so proud of it I will spend ages just re-reading it. So it works both ways, and for any aspiring authors out there I can only say that you need to take the good with the bad, and don’t give up… no matter how much you have to “delete”. And so, I love to work with my characters ( especially the animals ) but I hate editing! My routines are rather ragged. Having a full time job means I am often late home, leaving me very little time in the evenings for actual writing. I built a large desk in our spare room, and there I have two computers set up: one for writing, and another I use for on-line things. This way I can keep an eye on both screens at all times and switch from one to another within a few seconds. Yes, I love technology, and without it I would never have become published in the first place. Plans are afoot to install a third computer which will run a special programme I use for background book info. Always in the background is the radio, which playes “Real Radio Wales” from morning to night. But ocasionally I will put my headphones on and play some Bon-Jovi while I write… I know, rock music and fantasy are strange bed-fellows, but it works for me. QUESTION: Are there any books or writers who have especially influenced your writing? ANSWER: Straight away Sir Terry Pratchett comes to mind, along with the master, JRR Tolkien, of course. When it comes to dragons I must say that the late Anne McCafrey had a great influence on me during the eighties. There is also Terry Brookes and his fabulous Shannara series. There have been so many other incidental books I have read over the years, but those are the main four that will always spring to mind. ANSWER: Ah, the answer to that is very simple. But there are actually two. They are both wizards; the first being Gandalf from Lord of the Rings, and the second being my own Amvaar from the Silent Blade Chronicles. To sit in an old style inn with those two, drinking dark ale and listening to their wisdom and wit, would not only be so pleasant, but it would be a truly great honor. It would also be interesting to see how a conversation between these two would pan out. QUESTION: What books are you currently reading? ANSWER: At the moment I am currently plowing my way through several old classics. I downloaded these a few weeks ago; all books I read when I was a boy, and before I became interested in fantasy. These include “The adventures of Tom Sawyer”, “White Fang”, “Kidnapped”, “Gulliver’s Travels” etc. I have also downloaded a large amount of Dickens books, which I will get round to re-reading very soon. This is a bit of a departure from my usual fantasy reading material, but I see it as having a small reading holiday. QUESTION: Please list any websites or social media links for yourself or your book.Thanks! ANSWER: At the moment I do not have an actual website, although there is one planned. But I do have a blog and the Silent Blade have their own Face Book page. I have listed them below, along with links to the Amazon sites where you can find my books. First up is my blog. Once again, Thank you for the interview Susan. Leave a reply on "Meet the Author: David Graham"